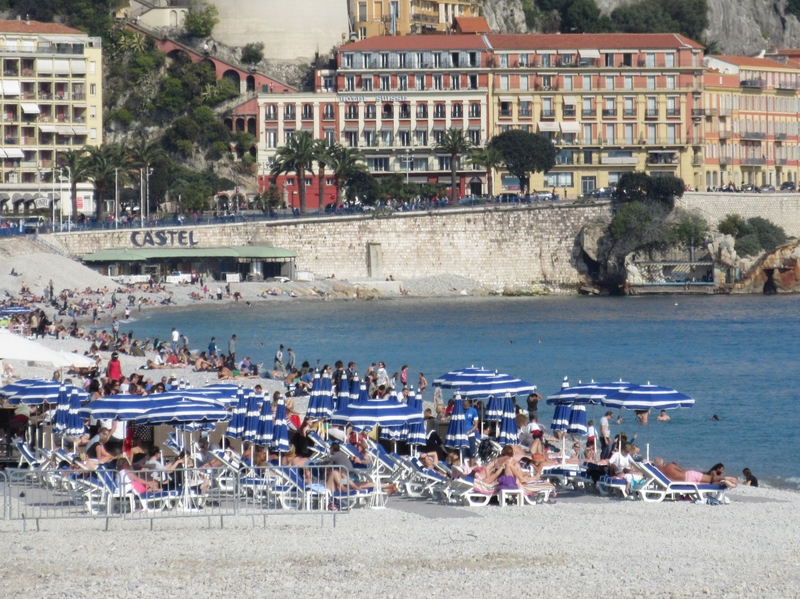 Things are warming up on the French Riviera. We moved a bit east of Saint-Tropez to some of the other resort cities. 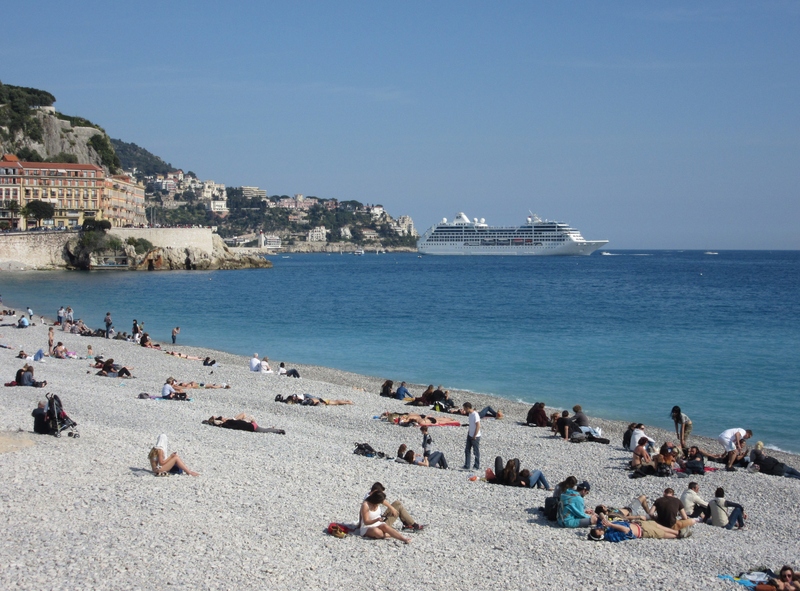 Everything you expect for the Cote d’Azur: sun, beaches, blue waters, and a cruise boat or two. Things are nice in Nice. Cote d’Azur means “Azure Coast.” Azure is blue. We’re finding blue everywhere along the Riviera. Looks can be deceiving. This near wall of windows and balconies is actually a painting on a solid wall. Nice has a large, beautiful pedestrian plaza named Place Massena. It is, however, cut through with an electric train. (They can be quiet and sneak up on you!) 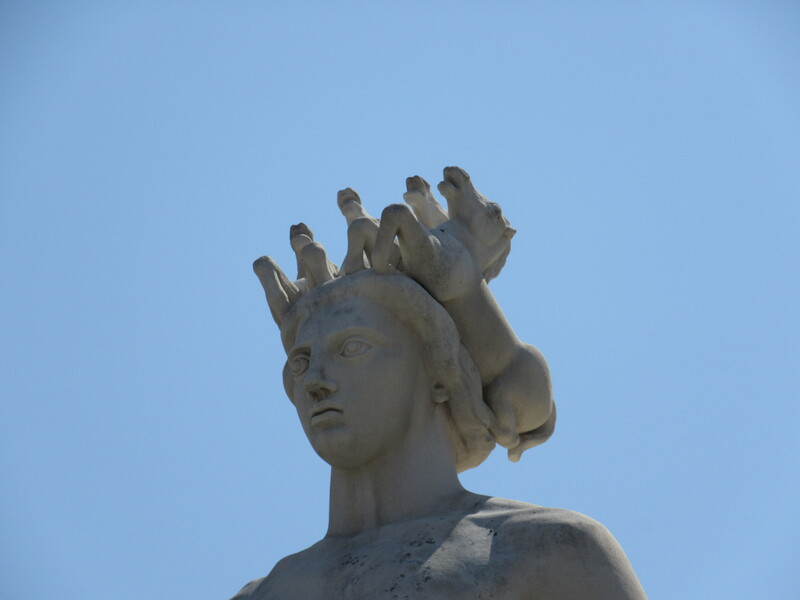 The plaza has a beautiful fountain with a statue fittingly known as Fontaine Du Soleil, Fountain of the Sun. A 21-foot-tall marble statue of Apollo is surrounded by bronze statues representing Earth, Mars, Mercury, Venus and Saturn. The large naked Apollo was removed from the square for many years for “moral disruption” and just returned in 2007. We wondered why he wore a crown. Not a laurel crown. It’s his four horses. They look rather small to be pulling Apollo’s chariot. On a lovely spring day we saw fellow tourists, school groups, a bevy of middle-aged women artists sketching, and some buskers. One in particular impressed us: Aaron Lordson. He’s from Togo and sings in English with a rich, deep, beautiful voice, albeit a few unusual pronunciations. We’ve been listening to one of his CDs as we drive around. We visited the modern art museum MAMAC (Musée d’Art Moderne et d’Art Contemporain), partly for the art inside (a separate post) and partly for the views. 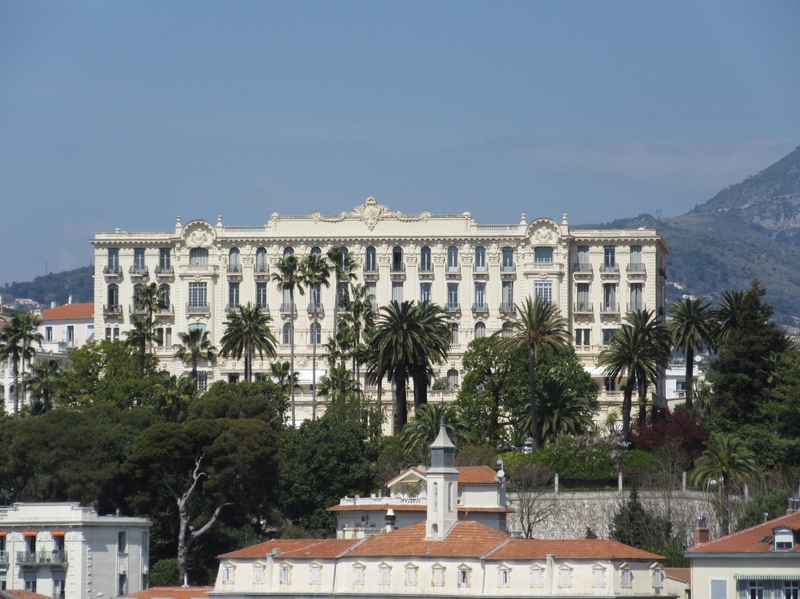 A palatial building in Nice. We don’t know what it is! 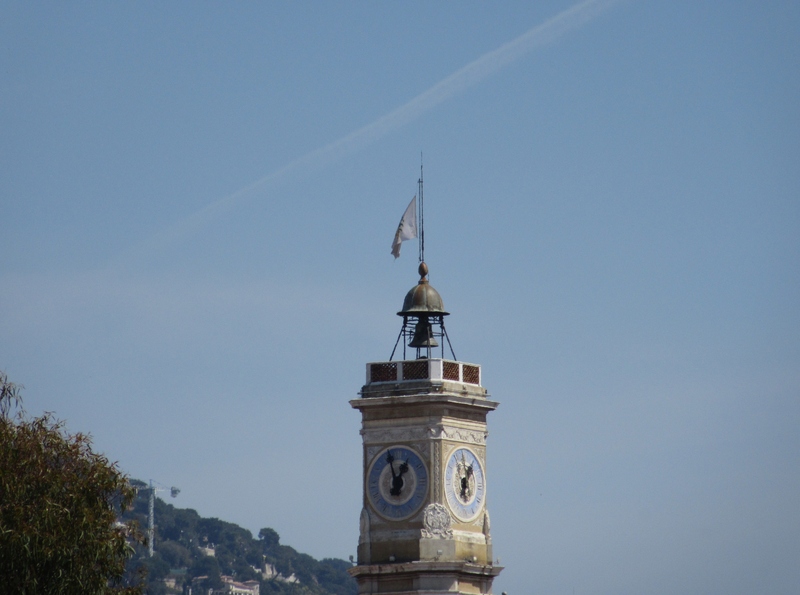 Nice has a mistral bell, this one on a pretty clock tower. 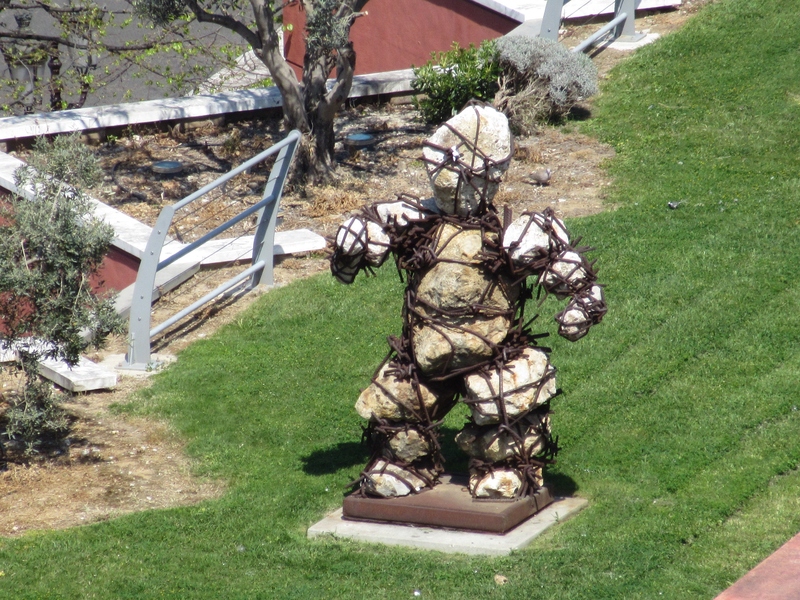 This looks like the gardeners tried to capture the Michelin man. 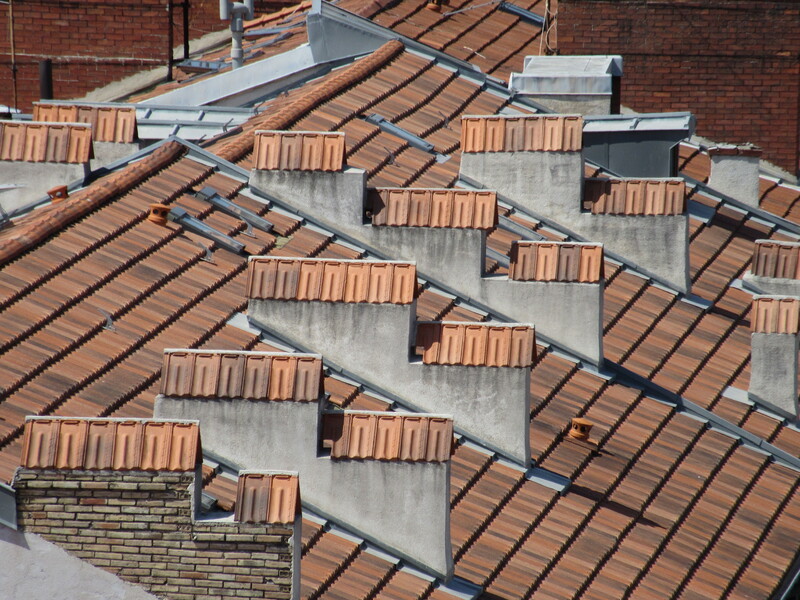 Lovely geometrics on the rooftops. 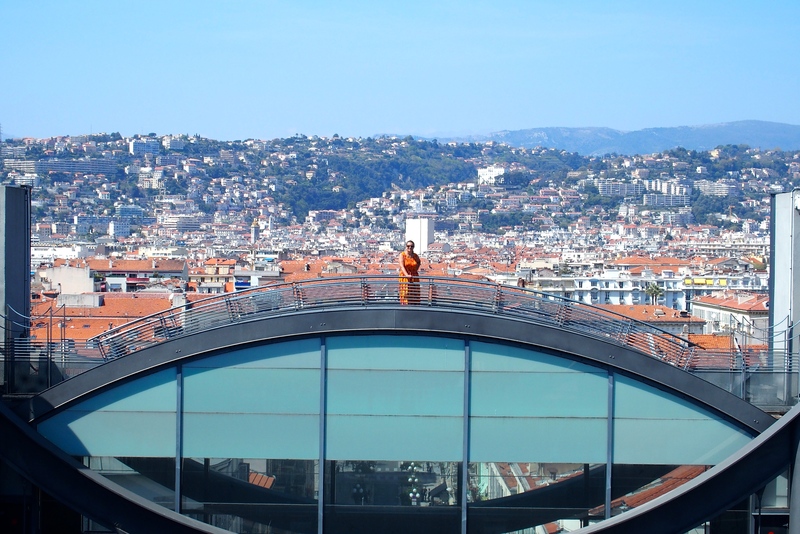 On the walkway on the top of MAMAC, Nancy is in orange camouflage to blend with the rooftops. 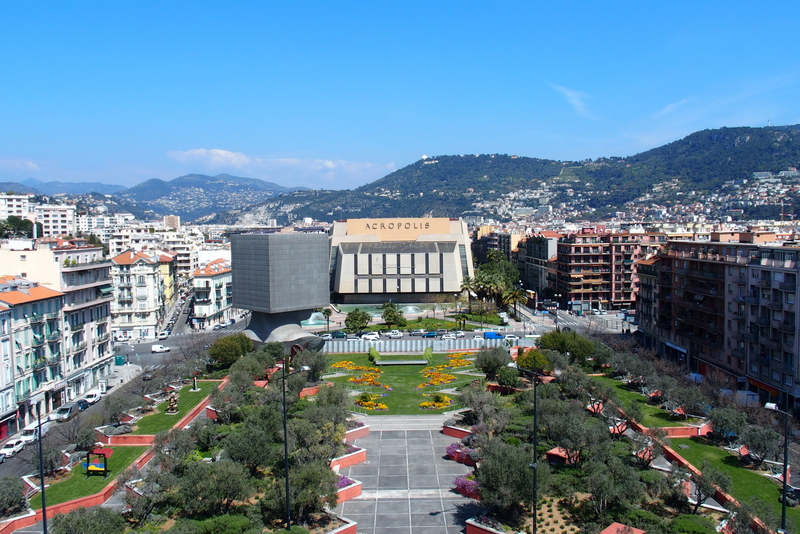 View from MAMAC toward the Nice Akropolis across the Promenade des Arts. The big gray block head, Tete Carree, is the administrative offices for the library. 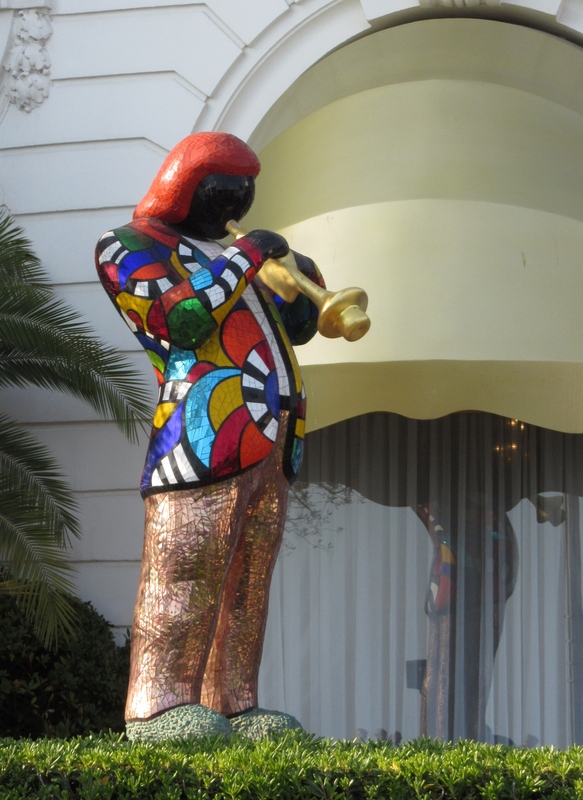 On our way out of Nice we passed the Hotel Le Negresco, displaying a colorful piece of art by Niki de Saint Phalle. We stopped for the evening in Cannes. The city is getting ready for the big film festival in May. Actually there is a digital festival underway already. No celebrity sightings…not live at least. We did see handprints, just like Hollywood. Angelina Jolie and Dennis Hopper have prime spots. We’re speculating that someone else was moved out to make room for Angelina. The prints are quite distinctive, showing individual personality. Sylvester Stallone made a solid push into and almost through the cement. Paul McCartney used just his fingertips, as if he were playing the piano. And this is from one of my (and NPR’s Terry Gross’) favorite composers, Michel Legrand, 3-time Oscar winner. Like the Academy Award has its Oscar statuette, the Cannes film competition has a highly desired prize, the Palme d’Or, the Golden Palm. 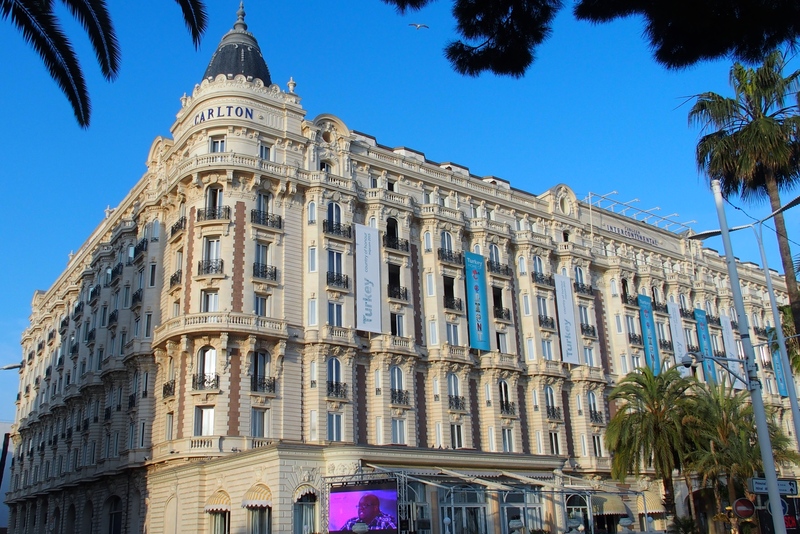 This golden angel in Cannes is ready to bestow a golden palm. Hotel Carlton, where Stephen and Kathy honeymooned! and lots will stay on their private boats. 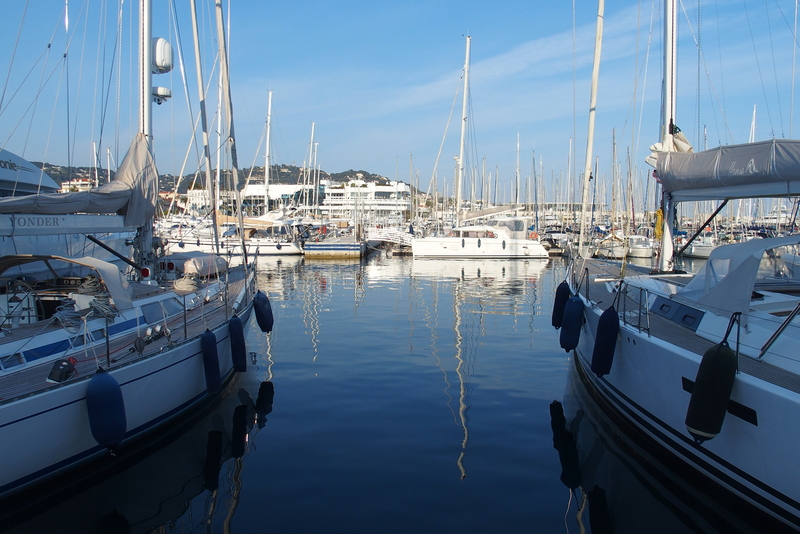 Yachts peacefully floating on the blue waters in the Cannes port. The big ones with celebs have not yet arrived. It’s easy to get carried away with the whole “Azur” idea. It’s such a lovely color. 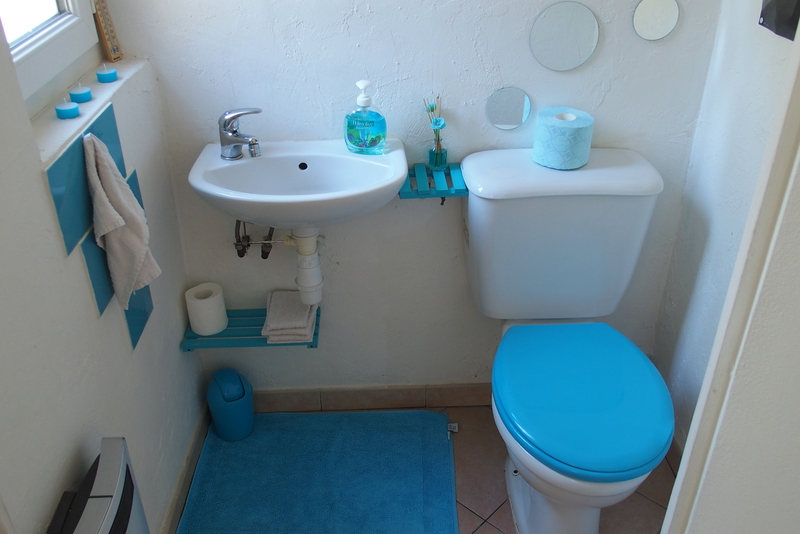 This was “la toilette” in our airbnb back in Grasse. Azure right down to the toilet paper! 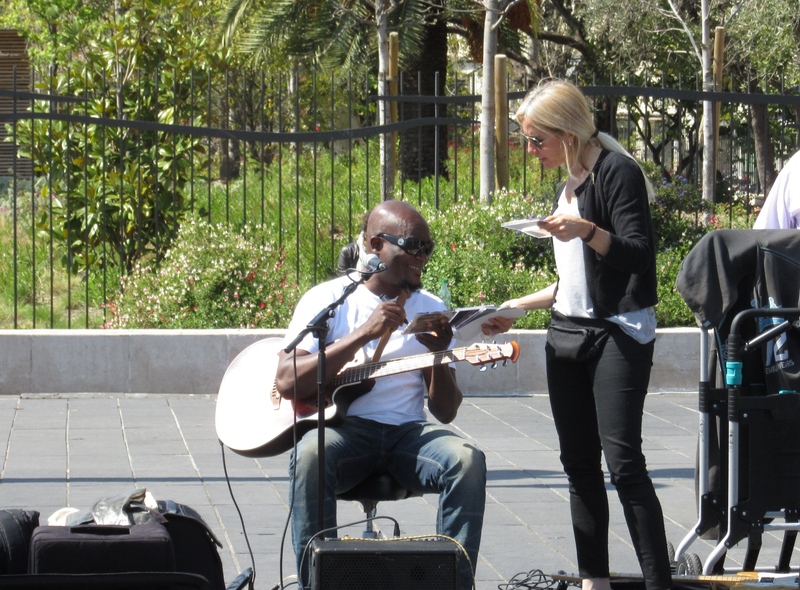 This entry was posted in Travel Journal and tagged Cannes, France, Grasse, MAMAC, Nice. Bookmark the permalink.